Snuggles is sort of like a tuxedo cat... but he is wearing a tweed suit. Snuggles is a 7-year-old white and brown female Tiger cat who still has plenty of kitten left in her. 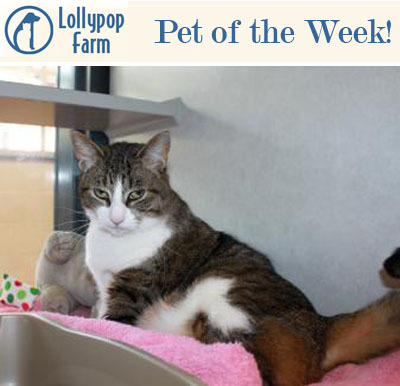 She was brought to Lollypop Farm because the landlord no longer allowed pets. This affectionate sweet girl loves to be petted, and will even let you rub her belly. She’s a staff favorite because of her goofy attitude, and loving nature. Snuggles is eligible for our Seniors-for-Seniors program, so approved adopters 60 and older can bring her home free of charge. Snuggles is also one of our Featured Felines: Brown Tiger Cats. From now through Sunday (11/14), adopt her for just $25, or any other brown tiger cat, 5 months or older! Come meet Snuggles today…what are you waiting for? Shelby, the dog from last week, is still waiting to find her new home.